Why Do Custodians Working for Non-Subscriber Employers Suffer Workplace Injuries? Janitorial staff provide a sometimes invisible but vital service in our hospitals, schools, businesses, retail stores, offices, and manufacturing plants by cleaning, repairing, and maintaining the buildings. However, this work is physically demanding and dangerous, and workers can suffer serious injuries, illnesses, or death. If they work for a non-subscriber employer in Texas who does not provide workers’ compensation benefits, these injured workers may still have a right to compensation for their injuries. Unfortunately, they may have to fight harder and longer for the settlement they deserve. What Are the Causes of Janitors' Injuries? Slip and fall injuries. Unsafe ladders, working from heights without safety equipment, debris and spills left on floors by other workers, and damaged flooring and stairs are a few of the ways that negligent employers cause workers to suffer injuries in slip and fall incidents. Electrical shock. Custodians must use electrical equipment, like vacuum cleaners, floor buffers, and power tools or be exposed to electrical wiring when making repairs. When the equipment is defective or in need of repair or the employee comes in contact with an electrical current, he can be electrocuted or suffer other electrical injuries. Toxic chemicals. 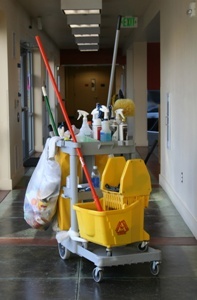 The cleaning supplies and products for the floor that janitors use can contain toxic chemicals and fumes. When custodians are exposed to these harmful substances over a period of time, they can develop asthma and other respiratory illnesses, especially if they are not provided with personal protection gear required by the Occupational Safety and Health Administration (OSHA). Blood-borne pathogen exposure. Janitorial staff can be exposed to blood-borne pathogens when performing their duties—even more of a danger in a hospital or doctor’s office—when safety precautions are not taken. This can cause them to suffer life-threatening diseases, such as liver disease and Hepatitis B virus. Lifting and exertion injuries. When workers are not provided with equipment to make lifting safer and easier, they can suffer back injuries and other injuries from lifting heavy buckets of water, equipment, and supplies and overexerting themselves. If you are a custodian and suffered a workplace injury, our experienced workplace injury attorneys can help you file your claim and fight for the compensation you may be entitled to. This can include payment for your medical expenses, lost wages, and pain and suffering. Contact us online or call us directly at 817.380.4888 to schedule your free, no-obligation consultation. We help injured employees throughout Texas including Arlington, North Richland, Grapevine, Bedford, Hurst, Euless, Irving and all points in between.